You’ve finally completed your orthodontic treatment and the braces you’ve been wearing for months or years have come off, revealing a beautifully straight and uniform smile. The last thing patients want at that point is for their teeth to revert to their original positions – that’s why Dr. Gary Cartwright strongly recommends the ongoing use of a retainer to his patients. 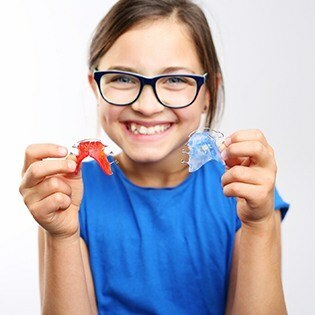 Like the name suggests, wearing a retainer can help your beautiful orthodontic improvements stay strong for years to come. Contact Cartwright Orthodontics today if you have any questions for our team, or if you’re ready to schedule your first appointment. We have two locations in Bethel Park, PA and McMurray, PA for your convenience. The retainer is initially worn all the time and then eventually only when sleeping. We will give you instructions specific to your needs when you receive the retainer, including when it should be worn and how to care for and clean it. How Long Will I Wear an Invisible Retainer? Days 1 – 3: wear 24 hours per day (take out to eat and brush teeth). 3 days – 4 months: 15 hours per day – after school and night. 4 months – dismissal (1 year): every night for one year. 2nd year of dismissal: 2 -3 nights per week. Forever: One night per week. We recommend that you clean your retainers with a toothbrush and cool water each time you brush your teeth. Avoid using toothpaste and a toothbrush, as it will break down the retainer material. You can soak the retainers in a 50/50 mix of denture or retainer cleaner and Listerine two times per week. Do not soak more than 15 minutes. Make sure to remove the retainer from the solution after that amount of time and rinse in water immediately. The Hawley Retainer is a common retainer used after the removal of braces. Retainers are necessary to hold the teeth into their new position, allowing for settling of the supporting tissues. Hawley retainers are made of acrylic and wire and are fabricated specifically for each patient by taking an impression. When you first get the retainers, you will be instructed to wear them full time except when you eat and brush. As your teeth stabilize in the bone, you will be instructed to reduce the number of hours you wear your retainers. We instruct and encourage all of our patients to continue to wear their retainers indefinitely. Even wearing your retainers up to two nights a week for the rest of your life will reinforce the stabilization of your straight teeth. How Long Will I Wear a Hawley Retainer? First 4 months: 24 hours per day (take out to eat and brush teeth). 4 – 10 months: 16 hours per day. 10 months on: Evening only. We recommend brushing your retainers under cool water with a toothbrush and toothpaste whenever you brush your teeth. For disinfecting, soak the retainer two times per week for no more than 15 minutes in denture or retainer cleaner and Listerine. Don’t leave your retainer on a cafeteria tray or wrap it in a napkin. You may accidentally discard it! Use your retainer case for storage. Don’t leave the retainer where pets can get them, as they enjoy chewing them. Don’t put your retainer in your pocket, as this may cause the wires to become bent or broken. Don’t place the retainer in hot water or near heaters. Don’t chew on your retainer, as this may flatten it and it will no longer fit.